One of my favorite GTD concepts is Areas of Focus. Using Areas of Focus in your personal productivity system helps group work into context. No need to look at todos like “Get House Painted” when you’re at work. It’s better to look at only work related stuff that you want to be focused on. For the longest time I’ve had Areas of Focus like House, Family, Marriage, Gear and Travel. I had one Area of Focus for work called PivotDesk. Inspired by a recent webinar on GTD Connect given by David Allen, I decided to refine my work-related Areas of Focus. As I went through this exercise, I had a chance to think through the different types of work a Product Manager interacts with to get the job done. Idea management, sprint planning, processes, team, budgets, timelines, product roadmaps, internal communication and demos. Scoping, customer interviews, idea validation, wireframes, designs, details and QA. Instrumentation, A/B testing, analytics and KPIs. Product tour, blog posts, inbound channels, segmenting visitors and drip email campaigns. I’ve found each of these areas requires a different headspace, pace and communication style. 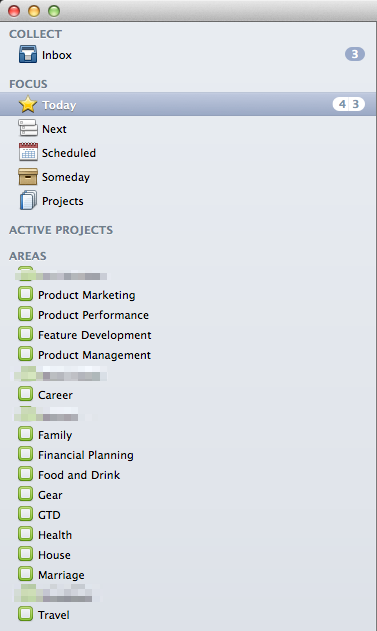 When focused on Product Management, my head is very much in business and planning mode. I’m emaliing, looking at the calendar and updating people. When focused on Feature Development, I am putting myself in our customer’s shoes, feeling empathic and brainstorming ideas. I’m staring at personas and drawings taped to the wall and getting whiteboard marker stains all of my arms and clothes. I’m far, far away from my email and calendar. What do your Areas of Focus look like?